President Trump has spoken several times of having a second summit early this year with Kim Jong Un. WASHINGTON — President Donald Trump met with a North Korean envoy Friday as the two sides worked to resume stalled efforts to end the North's nuclear weapons program by arranging a second summit with leader Kim Jong Un. Trump and former spy chief Kim Yong Chol were to discuss relations between the two countries and continued progress on what White House press secretary Sarah Huckabee Sanders said was "North Korea's final, fully verified denuclearization." The White House released a statement after the meeting saying the two sides met for an hour and a half and said Trump and Kim Jong Un would participate in a second summit happening "near the end of February." "The President looks forward to meeting with Chairman Kim at a place to be announced at a later date,” the statement read. 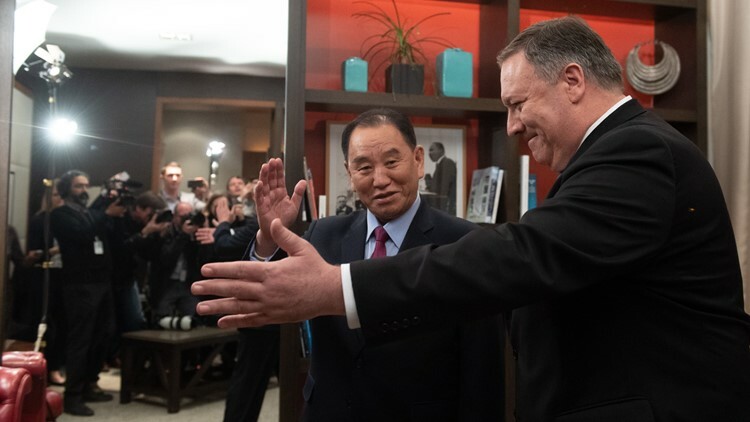 Kim Yong Chol earlier held talks with Secretary of State Mike Pompeo at a Washington hotel. A State Department spokesman, Robert Palladino, said they had a "good" discussion toward progress on commitments Trump and Kim Jong Un made at their June summit in Singapore. Trump has spoken several times of having a second summit early this year and has exchanged multiple letters with Kim Jong Un despite little tangible progress on a vague denuclearization agreement reached at their historic first meeting. Since then, several private analysts have published reports detailing continuing North Korean development of nuclear and missile technology. A planned meeting between Pompeo and Kim Yong Chol in New York last November was called off abruptly. U.S. officials said at the time that North Korea had canceled the session. US Secretary of State Mike Pompeo welcomes North Korean Vice-Chairman Kim Yong Chol prior to a meeting in Washington, DC, January 18, 2019. If Friday's talks go well, Steve Biegun, special U.S. envoy for North Korea, is likely to travel to Sweden for talks with a senior North Korean diplomat, said a U.S. official who was not authorized to disclose details and spoke on condition of anonymity. The North has so far rebuffed U.S. calls to appoint a counterpart to Biegun to hold working-level discussions and Biegun has yet to meet North Korean officials except with Pompeo. North Korea's deputy foreign minister, Choe Son Hui, was in Stockholm on Friday to attend a conference of international experts, according to the Swedish foreign ministry. Sweden has had diplomatic relations with Pyongyang since 1973 and is one of only a few Western countries with an embassy there. In the absence of formal U.S.-North Korean diplomatic relations, Sweden serves as the United States' "protecting power" in Pyongyang, a status that means it provides consular services there for Americans. The talks have stalled over North Korea's refusal to provide a detailed accounting of its nuclear and missile facilities that would be used by inspectors to verify any deal to dismantle them. The North has demanded that the U.S. end harsh economic penalties and provide security guarantees before the North takes any steps beyond its initial suspension of nuclear and missile tests. Vice President Mike Pence said Wednesday the Trump-Kim Jong Un dialogue was "promising" but "we still await concrete steps by North Korea to dismantle the nuclear weapons that threaten our people and our allies in the region." Trump has offered assurances that a second summit would allow the two leaders to seal a deal resolving the nuclear standoff and improving a relationship marked by decades of animosity and mistrust since the Korean War. Kim's latest trip to China, his fourth since last year, came as the North's strongest ally has encouraged negotiations with the U.S. while at the same time arguing in favor of immediate easing of sanctions. Independent analysts are highly skeptical that North Korea will easily abandon a nuclear arsenal constructed in the face of deep poverty and probably seen by Kim as his only guarantee of his government's survival.